Three bonded 18-karat gold dome drops, 8-11mm. 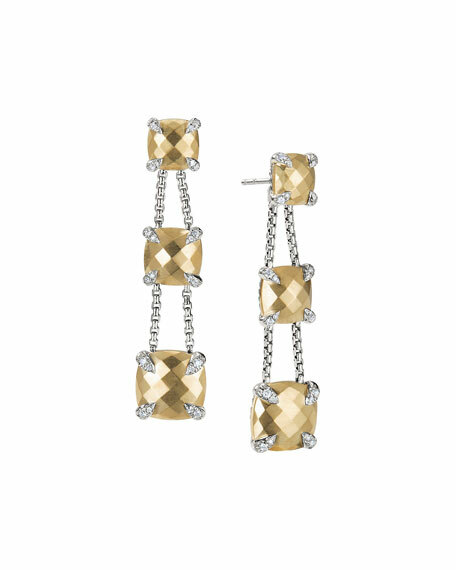 David Yurman drop earrings from the Châtelaine Collection. Sterling silver. Your choice of faceted Green Orchid, Lemon Citrine, or Hampton blue topaz. Prong setting with pavé diamonds. 0.21 total diamond carat weight. Approx. 1.3"L (32mm). For pierced ears. Imported. David Yurman earrings from the Châtelaine Collection. Sterling silver posts, hardware and prong settings. Garnet, milky quartz over mother-of-pearl and onyx. Post backs for pierced ears. Approx. 1.8"L drop. Imported. Convertible style: drop can be removed to allow top to be worn as a stud.